The ceiling is one of the most overlooked surfaces in a room, a missed opportunity for elevating the design of an interior space. Ceilings add an interesting layer to the overall design. Architectural features, such as beams and coffers or applied mouldings in either wood or plaster, create depth. This surface presents a canvas for pattern, texture and visual interest through material applications, such as wallcovering, grass cloth, or paint, and applied details, such as nail heads. The right selection can transform your room, turning a tall ceiling that is out of scale into a more intimate and inviting space. This surface can also help define areas within a room or create focal points. Ceiling details can help conceal unsightly mechanical equipment, grills and vents or enhance the lighting plan and overall ambiance. Creating complementary elements between the ceiling and flooring achieves a well-balanced and unified design. 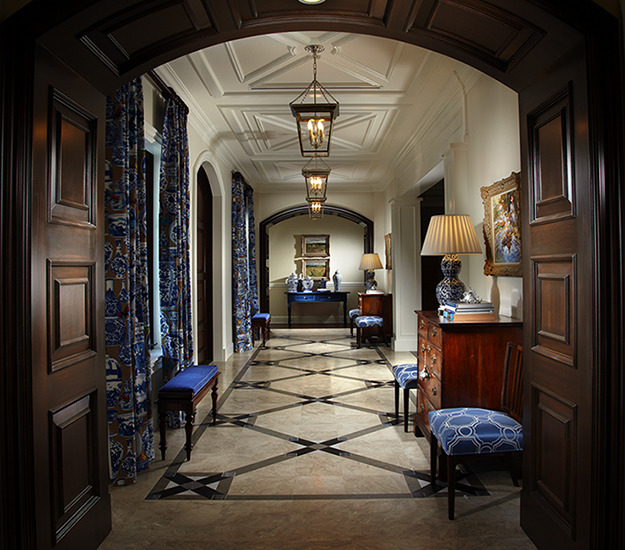 When a designer addresses all surfaces, a room is truly complete.